This route contains 2 hikes - which I did over 2 days in August 2010 from a base in Alpe D’Huez (Le Castillan). The first day included a fantastic Tour of the lakes on 2 levels - with a challenging climb/scramble just before lunch. The second day was more filling in time - as I took an excursion down to Oz station, then walked back. I didn’t quite follow my originally planned route - because it was somewhat tricky to plan from the maps - and when I got to the top I decided to take the easy route down (the cable car!) - which was infinitely more appealing than slogging down ski runs (especially with mountain bikers sharing the route). This first picture shows Lac Noir at the start of the Tour de Lacs, although I took this shot on the 2nd morning, just after the sun made it over Pic Blanc. On the first day (green track), I started at the car-park at Lac Besson - and did a modified Tour de Lac - the green route in the map below. 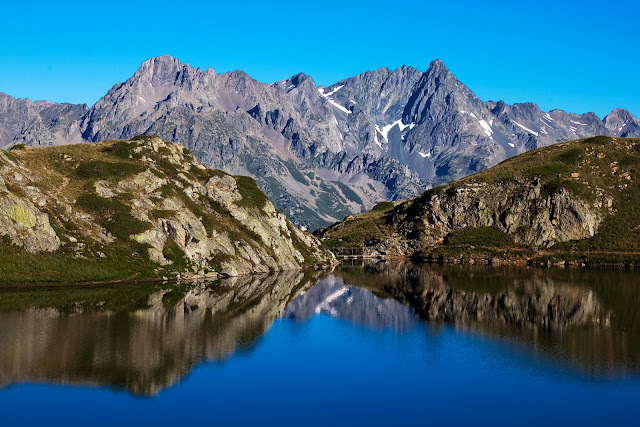 This was a fantastic route - passing many mountain lakes on the initial section of the walk (which is fairly flat), then a challenging climb to the upper mezzanine level - passing by some more lakes (and snow - as you can see from this shot of Lac de Milieu at 2679m). The climb up to the higher levels passed a refuge - where there was a couple serving food and drinks. It passed a few exposed sections on the rock where you had to do some clambering - but steel cables were fixed to the rock making it pretty easy. I wouldn’t want to do it in the wet - but in the dry, it was no problem. I ended the walk at the cable-car station (2616m) because the walk to the south looked somewhat uninteresting. From this mid-point station I bought a ticket to go visit the summit at Pic Blanc (3330m), then back down to take the light-blue track back to my car (from the station at 2108m). The first day’s walk was 12km, over a gain of 927m and loss of 316m (excluding the cable car); and another 2km to get back to the car. On the second day I thought I’d use the cable car from Alpe D’Huez (1850m) to drop down to Oz Station (1340m), however for some reason got off at the mid-point station on this run, and walked down from there (dark-blue track). It wasn’t a great walk - but passed some extra time (and let me get close to a geocache…). As I got to the bottom Oz Station, I was going to take a circular walk around the long way back to Alpe D’Huez, but got side-tracked by a sign leading up through the woods. This provided a good climb back up the valley tracing parallel to the path of the cable car. After finally making it back to the plateau I decided to go on a little further and headed up to the peak that overlooks Alpe D’Huez - Grand Sure (2114m). I took this pano on the path to the summit. The second day’s walking covered 11km, and 750m both down and up! 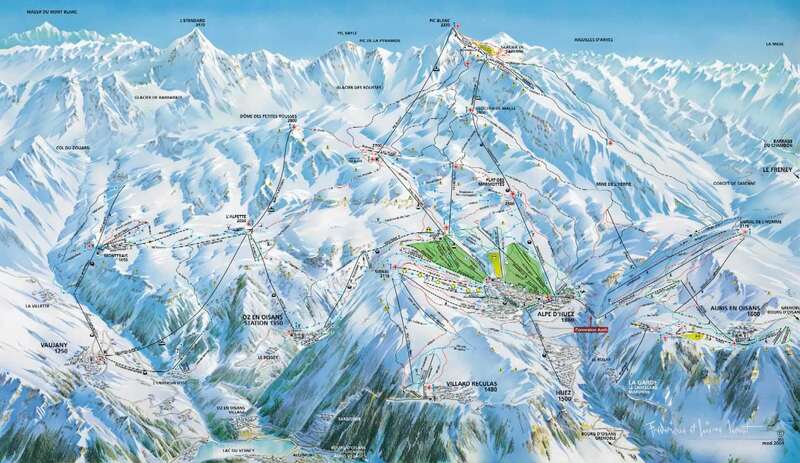 There’s a great ski-run map available. Cable car routes are indicated in dark-red on the map below.